The flood-lit Golden Gate Bridge, a suspension bridge spanning the Golden Gate, the opening of the San Francisco Bay into the Pacific Ocean at the blue hour after sunset seen from Fort Baker. 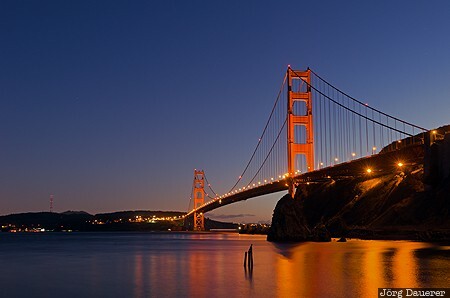 The Golden Gate Bridge is in California in the west of the United States. This photo was taken in the evening of a sunny day in November of 2012. This photo is part of the exhibition Blue Hour (October 2016). This photo was taken with a digital camera.